I continue to receive, and post on my Web site, emails from coaches thanking me for the defense and telling me of their team’s success with it. The GAM defense has won two Pop Warner national championships, helped a team go 19-0, and held opponents to 2.5 pts/game. [In 2008], our peewee team won the national championship 15-12. Without this defense and all the help you provided [by emails during the season] we would have never gotten this far and definitely not beaten the last team we played. This year I put in the singlewing and the GAM defense... We scored 283 points in 10 games, the defense only allowed 25 points in those games. The GAM defense is the only football defense in the universe that comes with a complete owners manual. The most popular youth defense, the 5-3-3, is not the subject of any currently in-print book. I do not like that defense at all, but even if a youth coach did like it, how would he know how to run it? There are no books on it. To date we are 19-0 and we take nothing for granted. I have studied and read Gap-Air-Mirror Defense at least 100 times. Recently, I have received multiple emails telling me that the spread offense has made its way to youth football. My book, Gap-Air-Mirror Defense for Youth Football shows you how to deal with the shotgun properly. See shotgun defense starting on page 31. I have also added pages of discussion and for diagrams to help you use the GAM to stop the speed option and the zone-read option that was made famous by San Francisco’s Colin Kaepernick during the 2012 NFL season. During the 2012 NFL season, San Francisco’s Colin Kaepernick made the zone-read option famous by using it to get to the Super Bowl. That will probably means youth coaches will start trying to use it. Because the zone requires huge line splits, which are suicidal in youth football, I do not expect the zone-read option to work as youth offense. But because you will probably see it, I put ways to use the GAM to stop it into the book. I also explained how to use the GAM to stop the speed option. The speed option and the zone-read option are double options, not the classic triple option. I do not recommend the GAM against the triple option. Use the Okal]ahoma 5-4-2 or Tampa 2 for that. Pressure is the easiest and best way for youth players to stop the pass because it’s the simplest and takes the least athletic ability. With the GAM, you have six to eight pass rushers, depending on the number of receivers the offense sends out for a pass. The offense has to block every single one of them or their quarterback gets sacked. The quarterback getting sacked was the main result when a team tried to pass against us. And they were better off. Some QBs saw the rush coming and just got rid of it to who knows where on a high trajectory—as if they felt being sacked was worse than being intercepted. We had one game where all the passes of the other team against us neither hit the ground nor were caught by their team! Jamming takes a bit more skill. The drills for teaching it are in my GAM book. You don’t need much jamming to be successful because the six- to eight-man rush will almost always hurry the quarterback if it does not sack him. Even a split-second delay in the receiver’s release can throw off the timing of the pass compared to what happened every time your opponent did it in practice (where no one jammed the receivers). Covering the receiver or a pass zone is the hardest thing to do. And even youth quarterbacks can find and hit an open receiver if they have enough time. Actually, I hesitate to even mention zone coverage. I tried it several times in youth football. What a disaster! I don’t know why, but the whole concept of zone pass coverage seems to be beyond the brain of a sub-16-year old. Even when I coached high school varsity, the defense could not do zone coverage in spring football. The varsity defense coach said, “Use man. I haven’t had time to put zone in yet.” At the youth level, you hardly have time to put in anything because you have to spend so much time on ultra basics like holding still until the snap, watch the ball rather than listen to the quarterback’s cadence on defense, and so on. So whenever there is a way to do something that saves time, it is all but mandatory for youth coaches. Gap-Air-Mirror Defense for Youth Football provides an extremely detailed description of how to staff, install, practice, and troubleshoot the Gap-Air-Mirror defense, or GAM. Gap-Air Mirror is terminology invented by John T. Reed to describe the modern, more flexible version of what used to be called the gap-8 and 10-1 defenses. The gap-8 and 10-1 names were confusing some youth coaches into thinking they should always have that number of men on the line and behind the line. In fact, with modern offensive formations that vary considerably even at the youth level, terminology that more accurately reflects the way the defense aligns against various formations was needed. Actually putting 8 or 10 men on the line every play is a good way to get killed. The GAM defense is the only football defense in the universe that comes with a complete owners manual. The most popular youth defense, the 5-3-3, is not the subject of any currently in-print book. I do not like that defense at all for youth, but even if a youth coach did like it, how would he know how to run it? Faded memories of how he played one defensive position 30 years ago? Is he really even sure his high school team ran the 5-3-3? 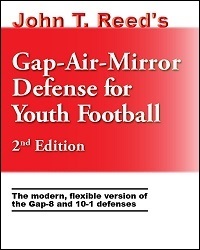 For those of you who already have Coaching Youth Football or Coaching Youth Football Defense, neither covers the GAM defense anywhere near as extensively as Gap-Air-Mirror Defense for Youth Football. Coaching Youth Football has one chapter on defense in general and several defenses. Coaching Youth Football Defense also covers multiple defenses, including the gap-8 and 10-1, but my GAM book is the only one that gives you every last detail on the specifics of the Gap-Air-Mirror Defense. Even though this defense is designed for youth football, it can be used effectively at the high school level as well, especially freshmen and JV.